The stock Jeep Wrangler is extremely capable off-road. Some owners think they need a lift and big tires in order to enjoy the trails in their Jeep. Well that’s not true! In fact the terrain you can handle in your stock Jeep is usually limited by the driver’s skill more than the vehicle’s capability. With that being, said some knowledge and preparation will ensure you have a safe and fun off road experience in your stock Jeep. Whether your rig is fully customized or bone stock a good rule is to never wheel alone. Having a friend with you ensures that you’ll be able to get out of any sticky situation you might find yourself in and you’ll have someone to share in the adventure! While major modifications aren’t needed to wheel your Wrangler, there are few things you’ll want to do to get the most out of your stock Jeep. In order to be ready for any type of recovery situation you might encounter, you’ll want to have recovery points in the both the front and rear of your Jeep. These will give your friend the most options when figuring out how to get your Jeep un-stuck. Another piece of equipment that is important to have is a full size spare tire. While the factory Jeep came with a full size spare, some people choose to run without one. When you’re off-road there are a lot more ways to get a flat and it’s important to have a full size spare to get you off the trail and back home. Additionally, disconnecting the front sway bar will allow your front axle to articulate or move up and down more freely, keeping all 4 tires firmly planted on the ground which is optimal for stability. Finally, whether you have stock tires or big mud terrains, airing the tires down will help with traction and ride comfort while off-road. Letting some air out of the tires will increase the footprint of your tire giving you more surface area to grip rocks, mud and roots. The decreased air pressure also makes for a smoother ride which is a huge benefit when you’re on the trail for a long day. A safe decrease in pressure is around 10psi from the recommended on-road tire pressure. This is not a “more is better” scenario as running too little air pressure can cause the tire to separate from the wheel. Now that the Jeep is ready, what can you conquer on the trails? 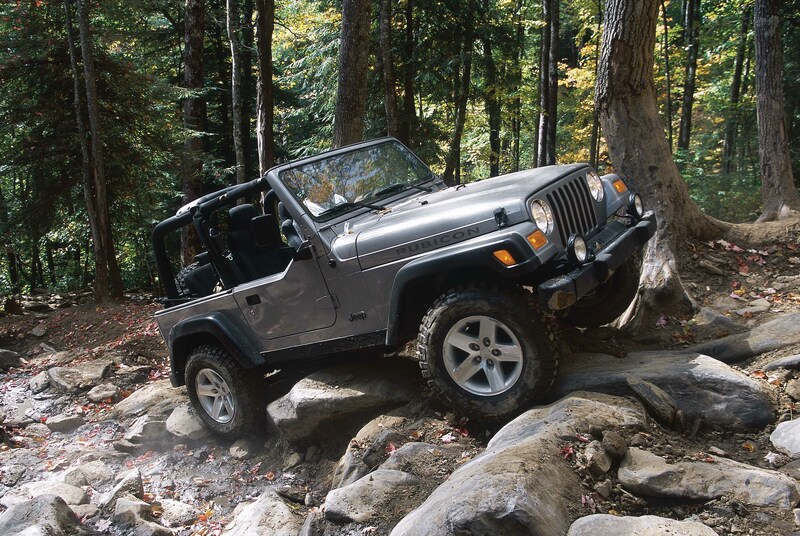 Start out on easier trails so you can get comfortable with how your Jeep behaves off-roads. The off camber or “tippy” feeling you can experience while navigating trails can take some getting used to. Remember that your stock Jeep can handle more than you’ll most likely be comfortable with the first few times out. This is good when you’re trying to keep from getting stuck or breaking anything, but can also get you in trouble if you’re not careful. Take it slow. This will not be your last time off-road so you’ll be able to hit those trails you didn’t have time for next time! When thinking about what your stock Jeep can and can’t do you’ll want to focus on what limits your Jeep on the trail. Ground clearance is one factor that should always be top of mind. You should know the lowest part of your Jeep and be ready to navigate obstacles so you don’t get hung up or high centered. Having that friend “spot” you or guide you through obstacles from outside of your vehicle can be helpful in keeping you moving. Another obstacle you might encounter on the trail is water or mud. With both you want to check the depth with a stick before entering. Make sure it isn’t more than you can take on. Water can be extremely harmful if it’s sucked into your Jeeps engine, so make sure the crossing is well below the air intake and drive slowly! With some seat time and practice, your skills as a driver will quickly catch up to the limits of your Jeep. When they do, you’ll be ready to start modifying your Wrangler to take on the tougher trails. Some of the most popular early modifications include Armor, Lift Kits and bigger, more aggressive Tires. The best part about being a Jeep owner is modifying it so don’t be afraid to improve your rig so it can always take you where you want to go! Not all accurate, it’s now2018 model year and yet no diesel. Had one on order, dealer says maybe late next year.